Balloons over Waikato Trust are feeling the love this Valentines Day and are delighted to announce our second featured special shape thanks to Resene. The Resene in Love with Colour Lovebirds was inspired while attending a Hot Air Balloon event in Thailand over Valentines last year. The Resene in Love with Colour Lovebirds is a heart shape balloon, standing 19.8 metres tall and 22.8 metres wide. 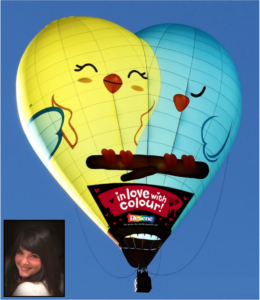 Resene’s Karen Warman says, “We are delighted to be working with the Resene in Love with Colour Lovebirds to bring our love of colour to the Waikato skies again. When choosing which balloon to colour up the sky, we couldn’t go past these bright lovebirds who clearly love colour as much as we do”. Come and feel the love at Balloons over Waikato Wednesday 22nd – Sunday 26th March 2017 with The Resene in Love with Colour Lovebirds.